When traveling in Honolulu, USA TODAY advises visitors to forget the touristy destinations, and get your Zen on at the Byodo-In Temple, located within the Valley of the Temples Memorial Park. A recent feature in the travel section of USA Today lists the top hidden gem travel destinations in each state. Citing the Japanese-inspired architecture, wild peacocks, koi gardens and reflecting pools as key takeaways from the temple, USA TODAY encourages visitors to get away from the typical site-seeing adventure and find some peace at this all-faiths Buddhist temple. There’s never been a better time to visit, as this year marks the 50th anniversary of the temple, which was established on June 7, 1968 to commemorate the 100-year anniversary of the first Japanese immigrants to Hawaii. The Byodo-In Temple in O’ahu is a smaller-scale replica of the over 950-year-old Byodo-In Temple, a United Nations World Heritage Site in Uji, Japan. The Byodo-In Temple is a non-practicing Buddhist temple, which welcomes people of all faiths to worship, meditate or simply appreciate its beauty. 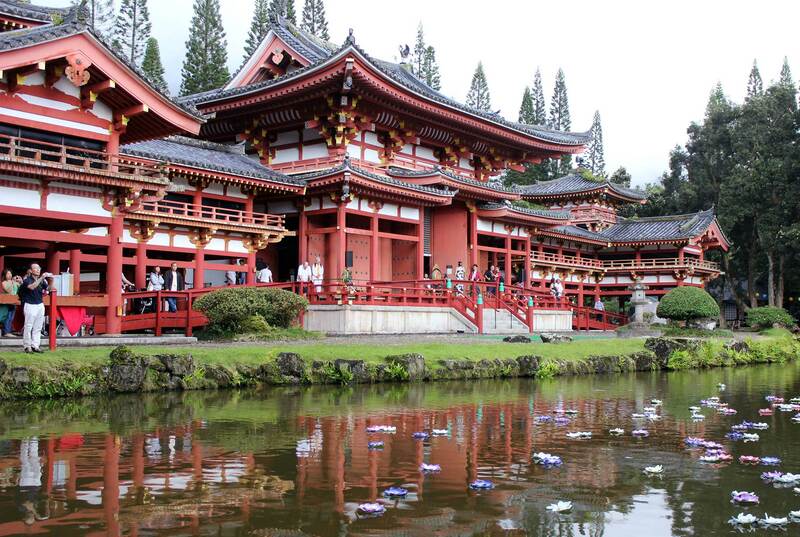 Learn more about the Byodo-In Temple.